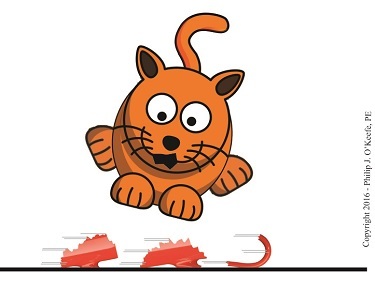 Last time we introduced the frictional force formula which is used to calculate the force of friction present when two surfaces move against one another, a situation which I as an engineering expert must sometimes negotiate. 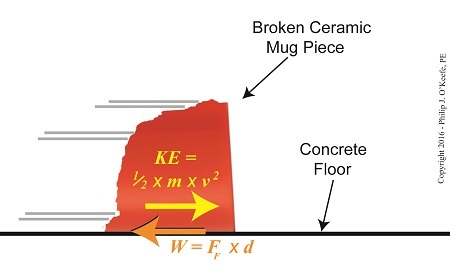 Today we’ll plug numbers into that formula to calculate the frictional force present in our example scenario involving broken ceramic bits sliding across a concrete floor. 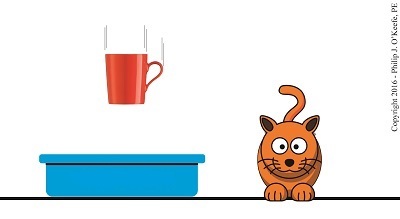 where the frictional force is denoted as FF, the mass of a piece of ceramic sliding across the floor is m, and g is the gravitational acceleration constant, which is present due to Earth’s gravity. The Greek letter μ, pronounced “mew,” represents the coefficient of friction, a numerical value predetermined by laboratory testing which represents the amount of friction at play between two surfaces making contact, in our case ceramic and concrete. To calculate the friction present between these two materials, let’s suppose the mass m of a given ceramic piece is 0.09 kilograms, μ is 0.4, and the gravitational acceleration constant, g, is as always equal to 9.8 meters per second squared. The Newton is shortcut notation for kilogram meters per second squared, a metric unit of force. A frictional force of 0.35 Newtons amounts to 0.08 pounds of force, which is approximately equivalent to the combined stationary weight force of eight US quarters resting on a scale. Next time we’ll combine the frictional force formula with the Work-Energy Theorem formula to calculate how much kinetic energy is contained within a single piece of ceramic skidding across a concrete floor before it’s brought to a stop by friction. 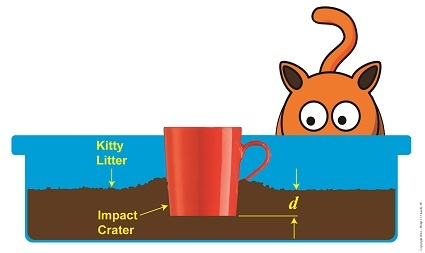 Last time we watched as the kinetic energy of our falling coffee mug was transformed into the work of creating a crater in a pan of soft kitty litter. 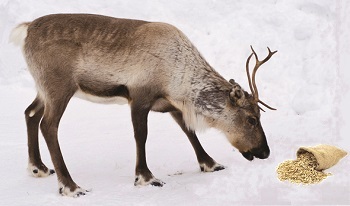 Shock absorbing materials are often placed strategically to cushion valuable objects should they fall, and as an engineering expert I’ve sometimes had to implement break-its-fall solutions. Today we’ll place our mug into a less kind scenario, one in which it makes impact with the unforgiving hardness of a concrete floor. In so doing we’ll compare the mug’s ceramic to the floor’s concrete, and we’ll familiarize ourselves with the Mohs Scale of Hardness. Material hardness is commonly measured by the Mohs Scale of Hardness, which ranks the relative hardness of a material by observing how resistant it is to scratching by other materials harder than itself. This standard was developed by German mineralogist Friedrich Moh in 1812, and it rates objects’ hardness on a scale from 1.0, very soft, to 10.0, very hard. A fingernail, for example, ranks 2.5 on the scale, while a diamond ranks 10.0. Now let’s take a look at the materials in our scenario, a ceramic mug and concrete floor, and see how they compare. The mug’s ceramic was created by mixing together clay, water, and other materials and then heating them in a kiln, a process known as firing. This firing causes a chemical reaction that bonds the individual materials tightly together, and when it cools it becomes the product we know as ceramic, a hard, brittle solid which registers at about 7.5 on the Mohs Scale. The floor the mug falls to is poured-in-place cement, a compound consisting of primarily limestone, clay, pebbles and sand. When these materials are combined with water a chemical bonding takes place and forms the hard, stone-like matter we know as concrete, which comes in at about 8.0 on the Mohs Scale. Although the mug’s ceramic is comparably hard to the floor’s concrete, its inherent brittleness, along with certain design features, most notably its handle, causes it to be fragile. Anyone broken a coffee mug lately? As for the concrete floor the mug falls onto, it won’t yield to the mug’s freefall kinetic energy and form a crater like the litter did. So where does the mug’s energy go? 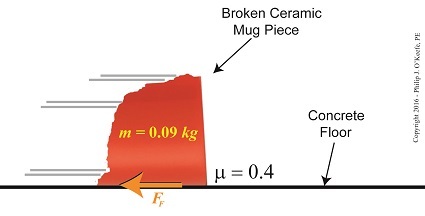 According to the Work-Energy Theorem, most of the mug’s kinetic energy is still converted into work, just as it was when it met up with the litter, but because the concrete floor is harder and thicker than the mug’s thin ceramic, the mug’s kinetic energy at impact falls back on itself rather than transferring externally into the concrete. The result is a shattered mug and a mess to clean up. But we haven’t yet accounted for all the mug’s energy. We’ll find out what happens to the rest of it next time.